Can’t decide if you want to play Football or Golf? Ballybane FootGolf @ Newcastle Golf Centre, Peamount Lane, Newcastle, Co Dublin. FootGolf is the latest craze sweeping the world and it is quickly becoming incredibly popular in Ireland. 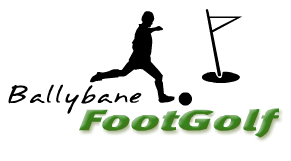 Known also as Soccer Golf or Football Golf, FootGolf is a combination of soccer and golf. The rules of footgolf are similar to the rules of golf. The game is played on a golf course, with sand bunkers and various hazards. The first shot has to be played from the tee, and to reach the hole, bunkers, trees and hills have to be crossed or avoided. The player who completes the 18 holes with the fewest shots wins. Families, Charity Events, Team Building, Corporate Days, Stag & Hen Parties. Close to the N4 and N7, Ballybane Footgolf offers a family friendly outdoor experience in a parkland location, where all ages can test their skills at a unique sport. It provides a an entertaining day for groups, corporate days and charity events. Stag and hen parties are also welcome. It takes less than 90 minutes for a group of 4 to play. You don t have to be a skilled footballer or golfer to enjoy the game, just a willingness to have fun! Special Offer €10.00 per person. Children play for only €8.50 each for 18 holes. Family of 4 based on 2 adults and 2 children only €34 for 18 holes. Footballs are available to hire at Ballybane FootGolf at €2.50 per game or you can bring along your own football. Runners or soft type footwear is recommended. NO GOLF SHOES OR FOOTBALL BOOTS PERMITTED, NO SPIKES OR STUDS. The course is located only 10 miles from Dublin city centre on the R120. Easy access from the M50/N4/N7, Just off the outer Ring Road. On the Number 68 Bus route and only a short drive from Clondalkin, Lucan, Newcastle, Tallaght, Rathcoole, Saggart, Blanchardstown and Palmerstown.